As times change and the Millennial generation replaces Baby Boomers as the dominant demographic of gardeners, will new attitudes impact the market demand for annual flowers? Will growers find that bedding plants are being replaced by more utilitarian, food-producing plants, or by more permanent perennial or shrub plantings? Growers and retailers need answers to these questions so they can anticipate and accommodate the needs of the changing market. While it is true that Millennials tend to value plants as a connection to nature, they also want instant, easy successes from minimal inputs. There is no doubt that annual flowers have a lot going for them, starting with their ability to produce long displays of color in beds, containers and baskets. But what about their need for regular water, fertilizer and deadheading, and the temporary nature of their contributions? Are annuals on the way out? Not according to Justin Hancock, horticulturist at Costa Farms, a wholesale house and garden plant producer based in Miami, Florida. These consumers, looking for something quick and easy to dress up outdoor spaces, appreciate the convenience of pre-planted container gardens. From a messaging standpoint, Costa Farms is promoting the idea that annuals offer instant impact for decks, patios, balconies and yards. Fear of failure among the gardening public also presents challenges when consumers are intimidated by the perceived demands of gardening. But when annuals are considered to be seasonal décor with a defined lifespan, the pressure to succeed drops off. Even without the proverbial green thumb, consumers can enjoy annuals without devoting hours every week to maintaining them or worrying about how to keep them happy and healthy. For consumers who instead perceive better value in perennial and shrub plantings, and for those who like to grow herbs and veggies, Costa Farms emphasizes the value of annual flowers as companions to other plants: annuals effectively bridge the gaps between perennial bloom times, and they add color and interest to herb and vegetable plantings while attracting pollinators. To make buying and growing annuals easier, Costa Farms also offers brands like Drop and Grow. 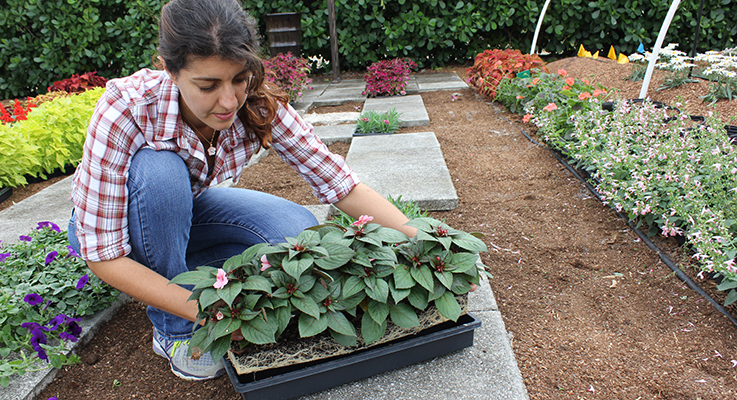 Drop and Grow plants are grown in a special tray so consumers just take them out of the tray, set them on loose soil, mound mulch around them, and add water. With no digging required, “planting” a display of annuals is easier than ever. Jeanine Standard, media and public relations officer for Proven Winners in Bloomington, Illinois, offered her insights: Despite changing demographics of the gardening public, there is simply no better way to provide reliable, dramatic color in planting beds and hanging baskets from spring to autumn than long-blooming annuals, she said. “Annuals are not going away, especially when it comes to beautifying large spaces,” Standard said. She pointed out that organizations like the Professional Grounds Management Society, whose members tend large properties including corporate campuses, casinos and universities, rely on masses of annuals to produce dramatic big-scale, colorful, seasonal displays. Breeders continue to deliver better, more forgiving and easy-to-care-for plants too, Standard pointed out. Among the improved features of new introductions, commercial and residential gardeners can expect annuals with increased tolerance for extreme temperatures, longer bloom cycles and continual bloom without deadheading. It’s imperative to educate customers about the ease of growing annuals and the benefits of new introductions, as well as to provide timely feedback to their questions and help them succeed, Standard said. Growers and garden centers can utilize websites and social media platforms to share design ideas and let customers know that new generations of annuals provide superior decoration with little work. Proven Winners takes consumer education seriously and fields hundreds of thousands of questions from customers, in addition to providing downloadable information and design suggestions online. Pinterest.com, now the third biggest source of information online, offers a searchable database and “plants are big” there, Standard said. For Proven Winners, Supertunia® petunias are their top-selling plant line, with a variety of habits to provide options for a variety of settings in containers and the garden. Charm Supertunias, for instance, develop a mounded habit, but plants also cascade over the edges of containers, so they function as both spillers and fillers in combination planters. Very densely branched plants produce small to very small flowers. They are also valuable in landscape plantings, especially as an alternative to Calibrachoa in areas where drainage is poor. Some new annuals can fill a 10- to 12-inch basket with just one plant. For instance, the enormous Vista Supertunias, which also develop mounding habits, produce such vigorous growth that they can get 2 feet tall in the landscape and trail or sprawl to 4 feet by the end of the season, making them very valuable in both beds and large containers. Improved colors and contrast drive interest in annuals too, Standard said. The ColorBlaze® line of Coleus produces foliage in dramatic colors with high-interest patterns, and the Picasso line of Supertunias features striking green edges on vivid magenta purple flowers. The unique color range on the flowers of Sunsatia Blood Orange (Nemesia) includes a symphony of bold, bright hues and soft pastels, and new selections of Ipomoea offer super dark foliage. New in garden centers this year, Quicksilver™ Wormwood (Artemisia) offers a vigorous display of silver foliage. Annuals also support pollinators and the ecosystem, Standard said. Proven Winners offers Bright Lights™ Yellow (Osteospermum), which has improved heat and drought tolerance, while Cuphea and annual salvia produce tubular flowers that attract hummingbirds. Ellen Egan, owner of Egan Gardens in Salem, Oregon, also stressed the eco- and pollinator-friendly appeal of annuals. She said that the new generation of gardeners wants to know what plants will do for them. She believes the top selling point for annuals is their long, continuous blooming season, which supports the needs of pollinators, including bees, butterflies and birds. Unlike perennials and shrubs, which bloom for shorter periods, annuals keep the food source coming. And they make great fillers between perennials and shrubs, adding aesthetic value too. In fact, more diverse plantings, in which colorful annuals are intermixed with shrubs and perennials, is the best way to provide for pollinators, Egan pointed out. Flat, daisy-like flowers including zinnias and marigolds, as well as Calibrachoa and trailing petunias, provide superior food sources for bees. Vegetative Calibrachoa are “wonderful, come in every color and bloom their little hearts out,” Egan said. Lantana has become more popular too, because it attracts bees and butterflies, handles heat well and comes in popular orange and yellow shades. Based on her experience producing seed-grown annuals, Egan sees changes in demand for annuals from a smaller scale, local perspective. The premium-type, vegetatively produced petunias have pushed a lot of the old seed-grown varieties out of the market, she said. For a grower, the premium selections cost more to propagate and are harder to manage in tray packs, though they do perform well and customers love them. Still, the way premium plants are used has changed, Egan said. With higher prices and better performance, their use is frequently limited to containers. “People rarely stick them in the ground,” Egan said. While the buying habits of gardeners may have changed, the market for planters and hanging baskets is fine, she said, but the demand for bedding plants has dropped. People buy fewer plants, so the market for color spots is up, but demand for seed-grown bedding annuals in packs has declined. People are pressed for time and have smaller garden space; Boomers with diminished physical strength are retiring and downsizing; and there is less willingness to spend money on what could be considered frivolous annual flowers. One exception to this trend is the market for zinnias grown from seed, which remains strong for Egan, because of superior options. The seed-grown Profusion line of zinnias is “as good a performer as the vegetative ones,” Egan said, and the Zahara zinnias from Ball Horticultural require “less care at retail for faster turns, less dump and better sell-through,” according to cultural guidelines. The experience at Smith Gardens, which has facilities in Oregon and Washington, is different. According to Denise Kelly, production planning and trial manager, Smith Gardens supplies both seed-grown and vegetatively grown annuals to big box stores throughout the Pacific Northwest. “Annuals are doing just fine,” she said, because gardeners want instant gratification and a long bloom. To accommodate conditions in the Pacific Northwest, Smith Gardens emphasizes plants that do well in low light and flower early, so day-length-neutral varieties are popular. So are bright colors that jump out, so-called “50 mph colors” that stand out even as drivers zip by in cars. With intense competition in breeding, seed sources have greatly improved F1 options, so Smith grows lots of annuals from seed. “We grow lots of packs and pints of petunias, marigolds, lobelias and wax begonias,” Kelly said. Even the market for packs of impatiens is still strong for Smith Gardens, Kelly said. Looking to the future of sales, Kelly expects a “game changer” in the form of increased online sales for the box stores. Even though there will be kinks to work out, Kelly said, this is definitely a topic of conversation among growers and retailers, who may decide to post availability online and let people place orders to pick up on site.